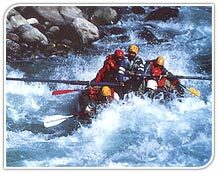 Rafting in India, Rafting India, White Water Rafting, Water Rafting India, India Rafting Tours, Rafting in India, India Rafting Travel, Rafting in India, Rafting Travel India. The challenge of the daunting, turbulent rivers is no less, than that of the rugged mountains. The icy heights of the Himalayas, are the source of some of India's mighty rivers. Fed by innumerable streams, they race along tortuous boulder - strewn beds, cutting deep gorges, and breaking into silvery white rapids. An intricate network of thundering mountain rivers, flowing through an amazing landscape of thrilling gorges, forests, and remote villages, the Garhwal and Kumaon hills, in the state of Uttaranchal Pradesh, provide ideal settings for some dramatic water adventure.